The thing is, I need to learn to trust my body again. My body is incredibly intuitive about its health. It regulates intake well, if I let it, and if I can separate out the emotional components. Example: When I was 17, I quit swimming competitively. For five years, I’d trained for 10-20 hours per week, and ate 7-8 times a day. My weight was stable around 125 lbs. When I quit, my appetite stayed high for three weeks, and I gained 15 lbs. This surprised me, but I honestly didn’t think too much about it. After three weeks, my appetite dropped off, my body regulated itself, and I stopped needing to eat so often or so much. The extra weight dropped off without me doing anything intentional. I just kept eating according to my hunger, and my weight stayed stable. So why the fear? Because after my freshman year of college, I had dental surgery that led to eleven years of illness. Eating according to my body’s intuition no longer helped. I had ups and downs completely beyond my control, not tied to the amount I was eating. It was in this period that I began monitoring-by-scale. Those infections were cleared out in 2009, however, and much of the weight loss that followed was grounded in intuitive eating. I outgrew the fear – until insomnia in 2011 added an unknown element in my loss, making it more difficult. Over the next fear years, I relied less on my body and more on data (numbers! ), and eventually that spilled over into emotional, disordered eating. And of course, this grew worse when I got on Zoloft in February, and started gaining 1-2 lbs per week, no matter how well I ate. I could no longer rely on my body – I was always hungry! – or on data – because the medication interfered. But here’s the thing. I’ve been medication-free for almost two months. I know how to eat healthy, and how to eat in moderation. I’m learning to handle the emotional component. I know what I need to do, and what my body is capable of. I need to stop letting fear push me back into disordered eating patterns. When I was a senior in high school, my choir took a multi-day trip to Houston for a competition. Our hotel had a pool, and one day, I went down to the pool with some other students. I had my bikini on under my clothes, and I pulled my t-shirt and shorts off by the side of the pool. One of the girls, I don’t remember her name, said, “Holy hell, Amanda! Where’d you pull off that body?” Immediately, I was self-conscious, and wondered what was so wrong with me that she’d have to point out my body specifically. I don’t remember what I said, if I said anything, and I don’t think I stayed at the pool long, or enjoyed myself. Only years later would I realize that it was meant to be a compliment, and that because I always hid my body under gigantic, shapeless clothes, and no one (except fellow swimmers) actually knew what I looked like. 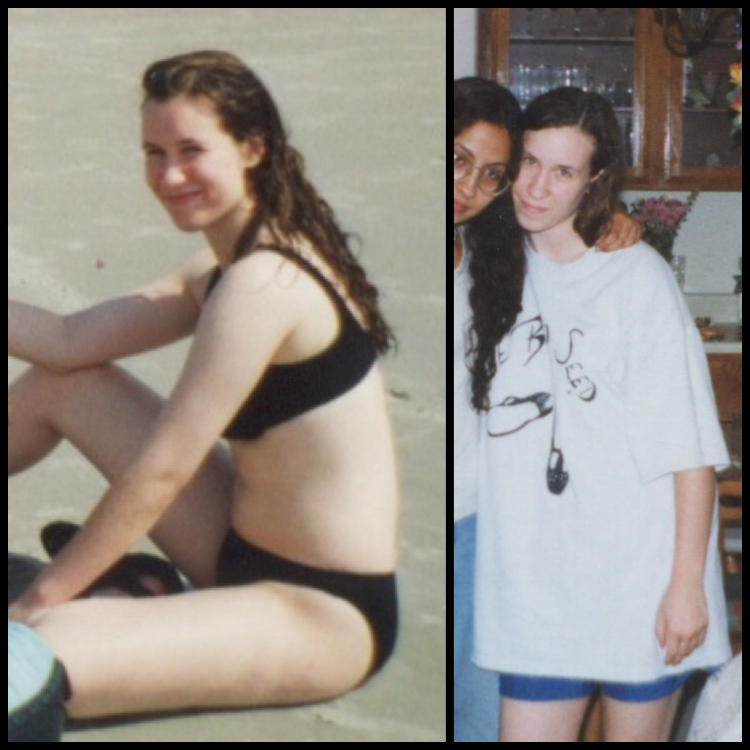 Furthermore, I was so self-conscious of my body that I literally have one photo in a bikini as a teenager, and I hated it because I thought it showed just how fat I was. The funny thing is, because I was a swimmer for so long, I’m not at all self-conscious in a swimsuit (I’m far more self-conscious in a skirt! ), but I still hated photos. I saw them as “proof” that I should keep piling on the baggy, oversized shirts. The above two photos were taken within weeks of each other. Stop hiding your body. Just stop it. Your body rocks. Don’t let anyone – not family, not peers, not even yourself – shame it. This entry was posted in Wellness and tagged body image, psychology, Wellness Wednesday. Bookmark the permalink. I wish I could go back in time and dump the baggy clothes. I think they disguised the weight I started gaining in college and made me less aware of what I actually looked like.